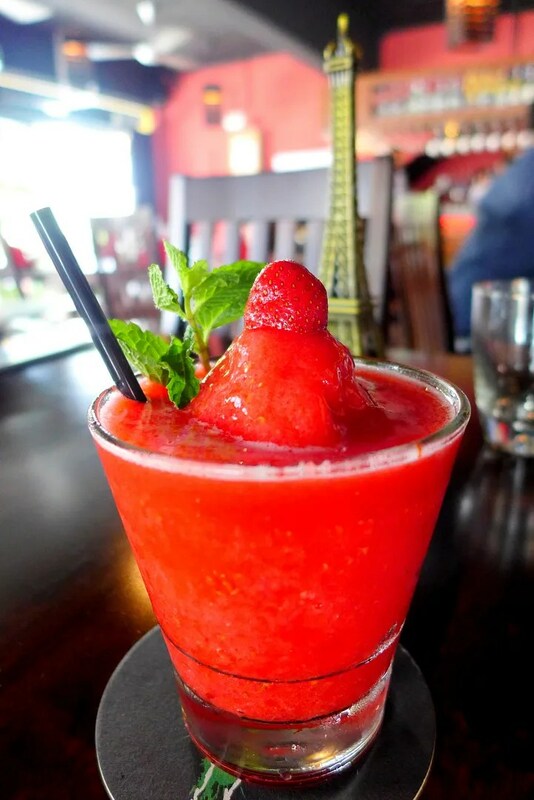 Klang Valley is definitely not short of French restaurants; whether you are after a date, or a casual family outing, there will be one to suit your need. When it comes to European cuisines, I have to admit I’ve always had a soft spot for the French. It might be an irrational one (blame it on movies like Julie & Julia, The Hundred Foot Journey & Ratatouille), but to me there is something romantic about the way the produce is handled, and the way the dishes are presented. Authenticity plays a big part in French dining experience too, and most of the times, keeping it traditional can be a winning formula. 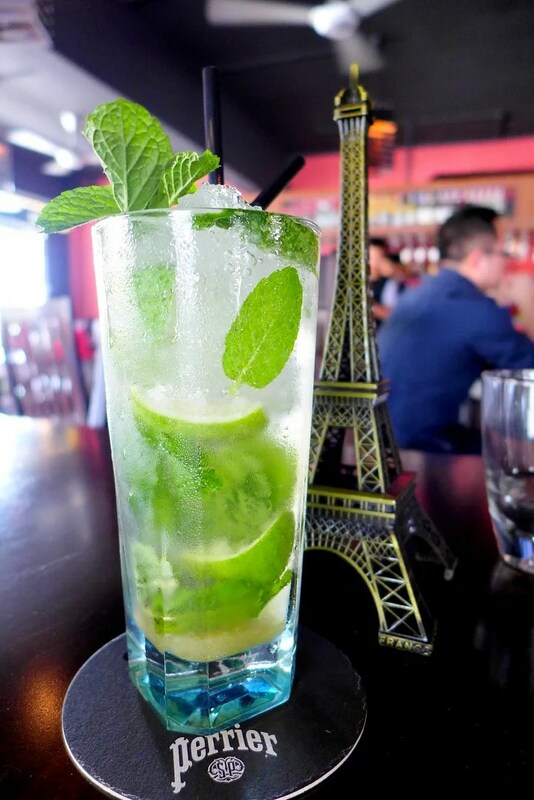 Introducing Rendez-Vous, a French restaurant & bar situated in the heart of Bangsar, with a concept to serve affordable authentic French cuisine. It’s relatively new (anything less than 1 year is new to me anyway), but already attracted loyal fans in the form of French expats and the Francophiles alike. Chef Florian Nigen has over 30 years of experience running a restaurant back in France (Bretagne, to be precise), and together with co-owner & manager Arnaud Chappert (formerly of Maison Francaise) put their heart into creating a memorable dining experience for the guests. While you might not be instantly transported to France walking in this restaurant, it does have a relaxed and laid-back ambience not unlike those of European countries. We left everything on Chef Flo’s capable hands while sipping their signature cocktails. 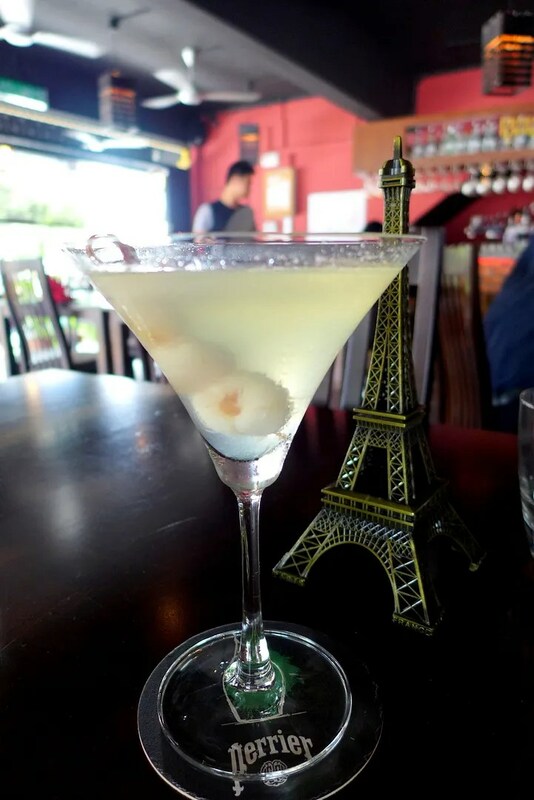 Lychee Martini for me. How did they know I love Lychee Martini? This is delightful with a nice kick. Mojito for Frank. He approves. This is non-alcoholic. But delicious! Available as part of the lunch menu. 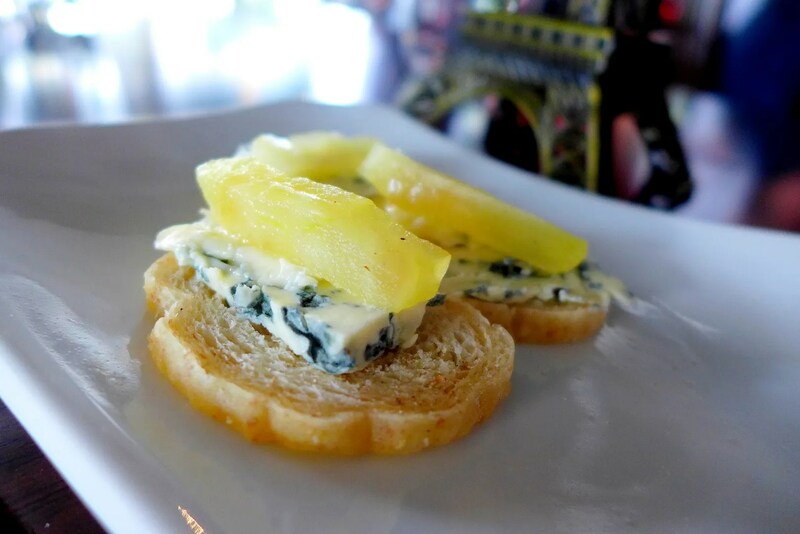 Amuse bouche came in a form of sliced baguette topped with some blue cheese and pear. 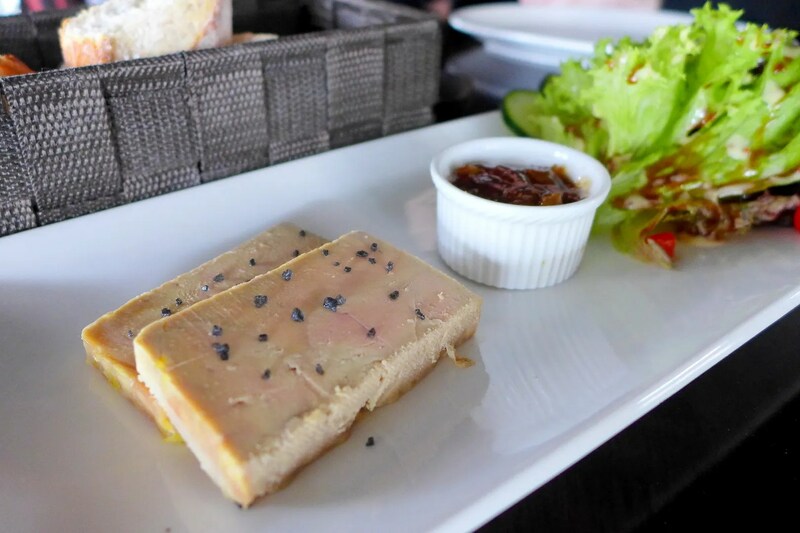 My attention was promptly distracted by this glorious serving of Foie Gras Terrine, however. I suspect this is the real reason why I love French cuisine. I guess you either love liver or hate it; and for me this is the utmost decadent gastronomical experience. Buttery, creamy, smooth, with ever-slightly metallic taste; paired with fluffy french bread and topped with tiny bit of fig compote. My life is complete. Ok, not quite but at least it made me a very happy girl. Since Frank doesn’t touch meat, let alone offals, all the more for me! Cholesterol? Waddat? Rendez-vous is changing up their menu and this was one of the new items. Instead of going the common pairing of Salmon and lemon butter sauce as per the old menu, this one is given a new life with a Bordelaise sauce, made with Red wine, shallots, butter and other herbs. The shallots give this sauce a pleasant sweetness, and I like how the Salmon is cooked to just underdone, the texture is perfectly tender. 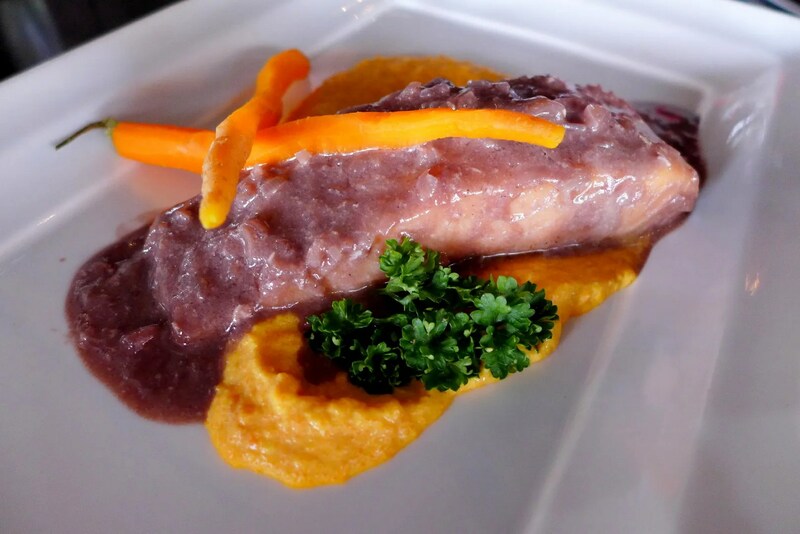 Surprised to see carrot in the mash too (also giving the mash an extra earthy sweetness). Overall the dish is on the sweet side (which I am not complaining), almost like having dessert as main, hah! The Pork Tenderloin I was told, is one of their signature dish and Chef Flo has managed to upgrade it by changing the cooking method. Can you tell from the picture? Yes, it is indeed Sous-vide cooked, for 5 hours no less, to achieve the texture he wants. 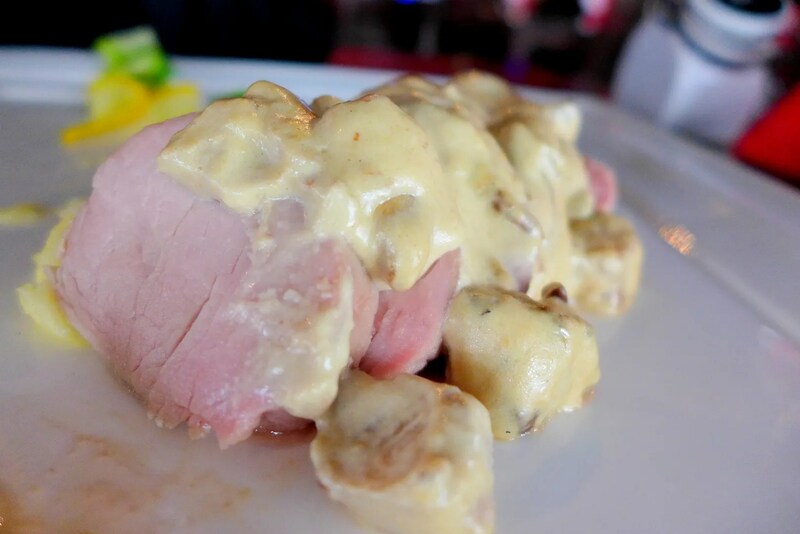 It is then paired with the ultra rich creamy mushroom sauce. While I found the tenderloin exquisitely tender, the sauce was a little too cloying for me. Check out the perfectly pink flesh! It’s cooked through by the way. As for the sides, Frank finished the mash potato before I could taste any, but if an Irishman approves of the potato, you know that it’s good. Afterall, potato is in the Top 3 of their food list, no. 1 being beer. 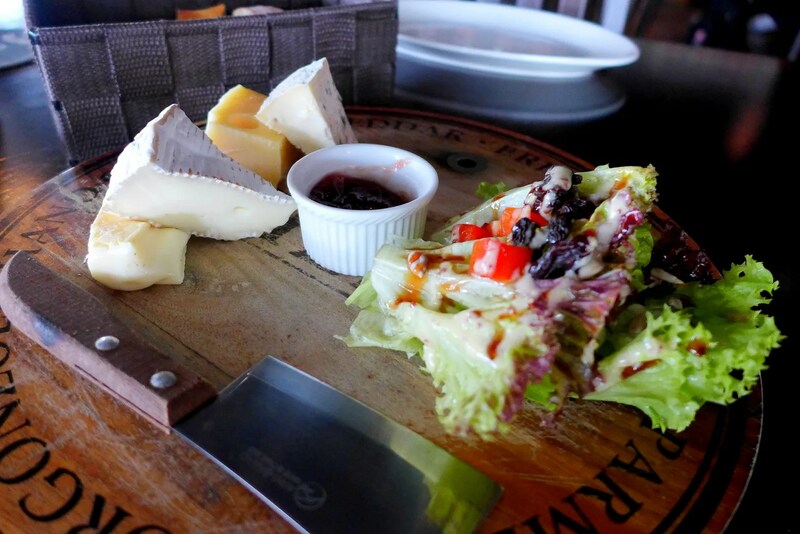 You know that Chef is serious about his cheese looking at this platter. I love the touch of a mini cleaver (maybe I am just naturally wacky). My favourite here is the Reblochon, which smears beautifully on the bread and has a nutty taste. The most pungent would be the Fourme d’Ambert, one of the oldest cheeses in France. A little goes a long way, this one. 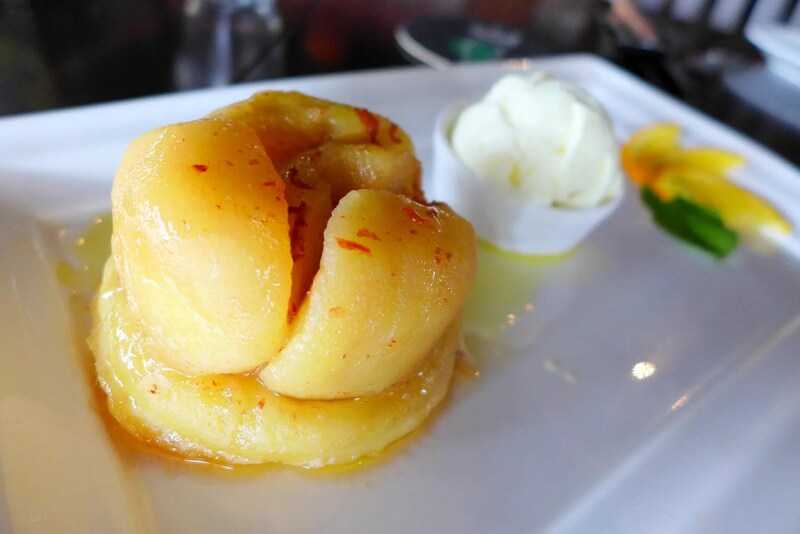 The apple tarte tatin comes with large chunks of apple and a small tart base, both of which soaked in caramel. While I enjoy the tender apple, I felt the tart base could do with longer amount of cooking to crisp up a bit more. However, this is divine when paired with ice cream. Thank you Rendez-vous for your hospitality! No doubt we will be back as I want more of that Foie Gras and also eyeing a few more things on the menu for next order. 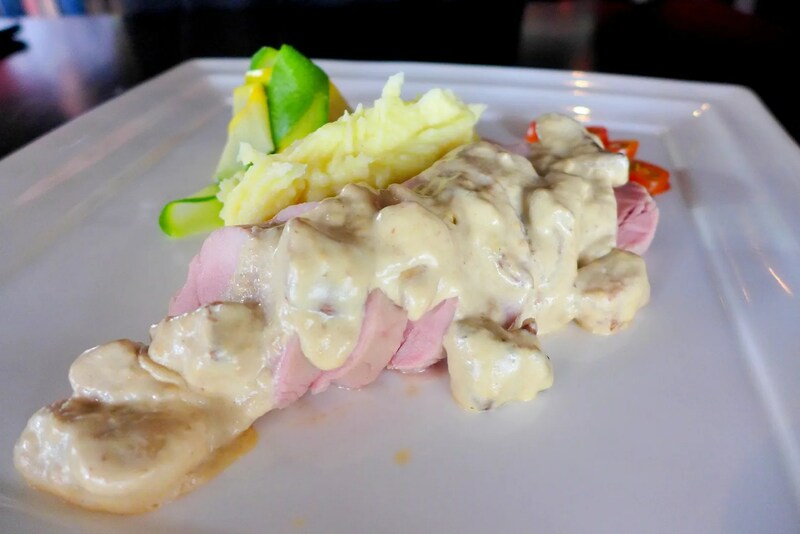 Rendez-vous also offers monthly wine pairing dinner as well as Sunday brunch where the kids get a special table with fun activities (what a great idea). 100 Lorong Maarof, Bangsar, Kuala Lumpur.